Careful, Aussie bears! 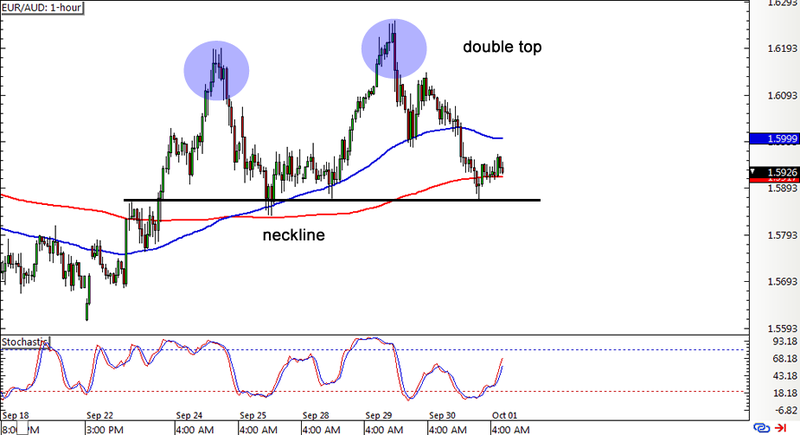 AUD/JPY might be done with its recent selloff, as the pair formed a double bottom pattern on its 1-hour time frame. It failed in its last two attempts to break below the 83.00 major psychological support level and is on its way to test the neckline at the 85.00 major psychological mark and 200 SMA. 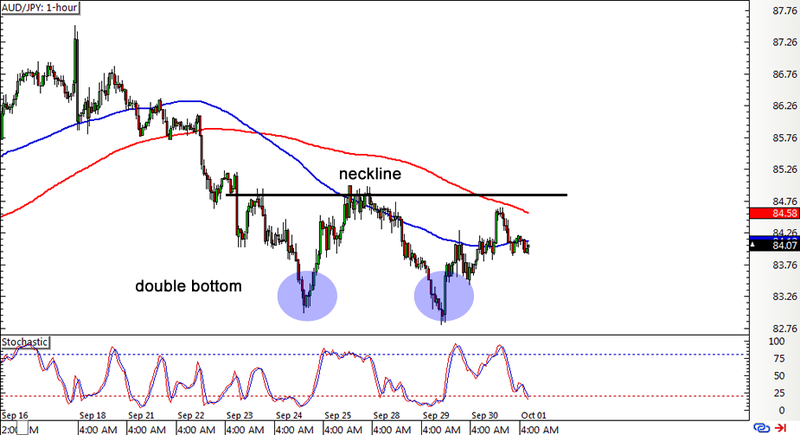 A break above this resistance level could send the pair 200 pips higher, which is the same height as the chart formation. Stochastic is nearing the oversold area, indicating that selling pressure is fading and that it might be time for Aussie bulls to charge. However, the 100 SMA is still below the longer-term 200 SMA, which suggests that the downtrend could still resume. Better review our lesson on How to Trade Double Bottom Patterns if you’re thinking of taking this one. Anybody gutsy enough to take a countertrend trade? 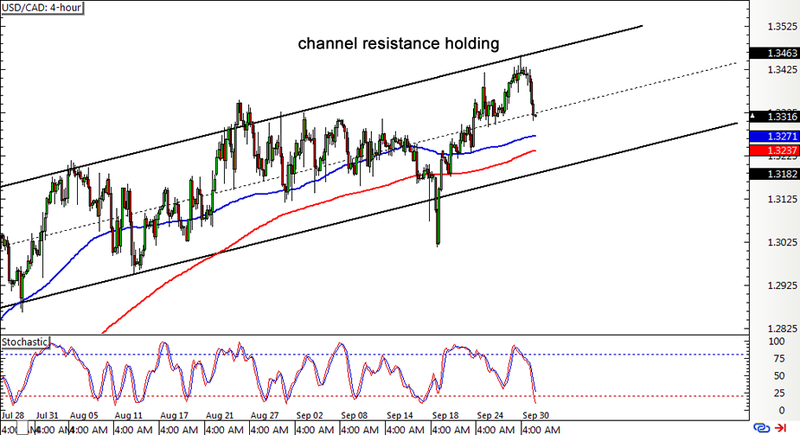 Feast your eyes on this rising channel setup on USD/CAD’s 4-hour forex chart since the pair is already finding resistance at the top of the range. If you think the downside momentum will stay in play, you could short on a break of the mid-channel area of interest around the 1.3300 major psychological mark. But if you have enough reason to believe that the longer-term climb will resume sooner or later, you could wait for a bounce off the channel support at the 1.3150 to 1.3200 area or the moving averages. Stochastic is moving close to the oversold region anyway, hinting that buyers could get back in the game later on, while the 100 SMA is still above the 200 SMA. Can’t get enough of reversal setups? Here’s another one on EUR/AUD’s 1-hour forex chart! The pair made a double top formation after bumping the resistance at the 1.6200 major psychological level and moving on to test support near the 1.5900 handle. Price is currently sitting at the neckline and 200 SMA at the moment, still trying to decide whether to make a bounce or a break. Stochastic is on the move up, suggesting that a rally might still be possible, while the 100 SMA is above the longer-term 200 SMA. This could lead to another test of the previous highs and the creation of a triple top, which is still a valid reversal pattern. On the other hand, if euro bears gain enough strength, they could push for a downside break and as much as 300 pips in losses for the pair.